I prefer jogging in the fresh air, and there are many reasons I hate the treadmill. I'm sure you can relate, so here are five easy ways to make your treadmill time more fun and enjoyable. Gripe: It's way too boring. Solution: Staying in one place can have its downfalls, so make it fun by listening to an audiobook, learning a language, watching a movie or TV show, perusing a magazine, listening to a great running mix, or trying out a new treadmill routine like this 400-calorie tush-toning workout. Solution: You can't stop the noise, but you can prevent yourself from hearing it (and that annoying guy trying to pick you up) by wearing a set of good noise-blocking headphones. Gripe: It's too repetitive on my body. 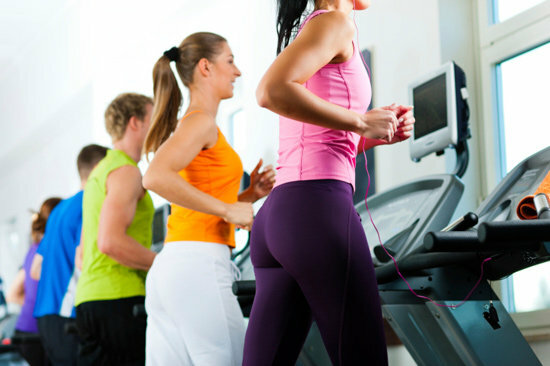 Solution: The great thing about treadmills is that you're in control of the speed and the incline. So mix it up to feel different effects on your body. If you don't want to futz with the buttons, many newer treadmills offer built-in interval workouts. Select a workout from the list and it'll make you feel more like you're running outside than just running on a hamster wheel. Gripe: I don't believe the readout. Solution: When using your own treadmill or one at the gym, you get accurate readings of the time, distance, and how fast you're moving, since these are simple functions the machine can figure out by using the clock and the speed of the belt. When it comes to calories burned, if there's a place you can enter in your weight, then the calorie readout should also be fairly accurate. To be sure, you may want to get a heart rate monitor or use a running app to keep track. Gripe: It's easier than running outside. Solution: The moving treadmill belt helps propel your body forward and you don't have wind or bright sun to deal with, so in those respects running on the treadmill can be easier than hitting the open road. There are ways to make it more challenging though. Try increasing the pace, doing sprinting intervals, and raising the incline.